Driver Distance: Equipment, Fitness, or Impact Physics? Is improvements in equipment, fitness level, or a better understanding the proper techniques of impact creating longer drives for players? We will look at the PGA Tour players from 1998 and 2014, Tiger Woods in 1998, and Rory McIlory in 2014 to make the point of gaining certain club parameters are very important to your success off the tee and hitting the longest drives possible at your clubhead speed. Comparing Tiger and Rory is becoming a very common theme after the recent double major win from Rory at the 2014 British Open at Royal Liverpool Golf Club and the PGA Championship at Valhalla Golf Club, not to mention the WGC Championship at Firestone CC in between the two majors. If you were to simply take a look at their driving stats between Tiger in 1998 and Rory 2014 there are some interesting conclusions to be drawn. I think the characteristics of the club at impact and club head speed are the major similarities and equipment advances have not had as much of an effect as we would all like to think. With courses getting longer and all the talk of the game getting easier for the best players in the world this is a relevant discussion about technique, physics, fitness, and equipment. – That would be mean Tiger is gaining 2 extra strokes against the field for every 4 round tournament he played in compared to Rory in the modern era, just think he won 3 of his majors in a playoff, 3 majors he won by 2, and 1 major he one by 1 stroke, those 2 stroke per tournament turned out to be a big help. – Average of Watney, Garcia, de Jonge, and Na’s spin rate is 3114 rpms and launch angle is 9.14, exactly what the Tour average was in 1998 was, but their distance average was 289.5 verses 270.3 in 1998, that is 19.2 yards further from 1998 to 2014, so equipment has helped the player that does not have the best impact physics to keep up with players that have maximized their launch angles and spin rates. The golf ball is obviously helping their cause as well. – Notice that if Watney, Garcia, de Jonge, and Na were to improve their spin rates and launch angle how it would effect their strokes gained and scoring averages, very minimal so you can see why these guys are not completely eliminated from the tournaments soling by distance. “THERE IS MORE TO THE GAME!”, this is just 12 to 13 shots per round and to the average Tour player this would not be a significant improvement! Such as strokes gained Tee to Green and Putting strokes gained, “all aspects of the game are equally important” Mark Broadie, Research Director of the Program for Financial Studies and PGA Tour consultant, on the importance of all aspects of the game. 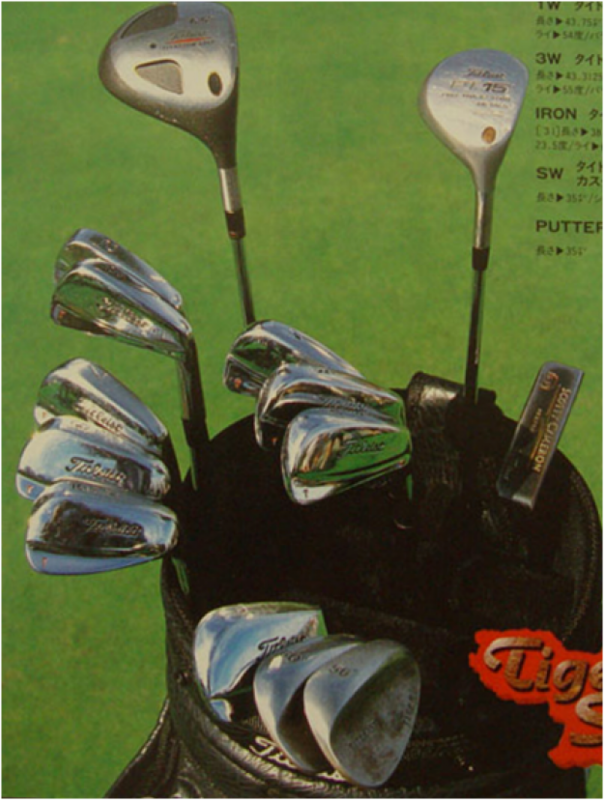 I am proposing that Tiger in 1998, either consciously or unconsciously, was maximizing the impact physics and equipment that we are starting to understand more rapidly over the past 5 to 7 years and that is why his driving was gaining him 1 and 1/2 strokes per round on the field in 1998 verse Rory picking up 1 stroke per round in 2014. The distance gap is being closed due to fitness levels, equipment improvements, and more importantly players understanding the impact interval physics that are required to hit the ball further. I think players are hitting the ball further due to these three different measures, but not all of them are using all three of these factors, some are depending on equipment to enhance their driving distance, some focus on the club physics at impact, and some are focused on fitness and clubhead speed. Rory is maximizing these three things at the same time and that is why he is driving the ball as well as anyone has driven the ball in the past, sounds like the other guy we were talking about as well in his prime in 1998. FITNESS, EQUIPMENT, AND IMPACT PHYSICS are the secret and for the average player they should be trying to increase all of these to gain maximum yardage. This shows that increased distance for the average player could get them into lower approach bracket and thus hitting more greens in regulations and this tends to lead to lower scores. There is a 20% variance with the 90’s player between the two ranges and a 13% difference between the Tour players two ranges, this would show that most average players would be better off closer to the hole from the fairway. As if that was not obvious, this just shows that it is more important for the 90’s player than the Tour professional, they are still hitting a high percentage of greens from the further distances because they are hitting lower irons and hybrids into the greens and the 90’s players are hitting longer clubs and woods into the greens from the same distances. This is why the Tour professional might not need to hit it significantly longer to score better, and for those Tour player that hit down on the ball they might hit a higher percentage of fairways than when they hit up on the ball at impact, so their average approach shots are better for the fairway and that could trump some of the distance they are sacrificing. Everyone is different when trying to increase distance and the next few paragraphs will help you get a better understanding of which factor you should be working on to improve your distance. Clubhead speed aside, because that will be addressed in the clubhead speed section lets look at the club impact physics and how to improve distance. 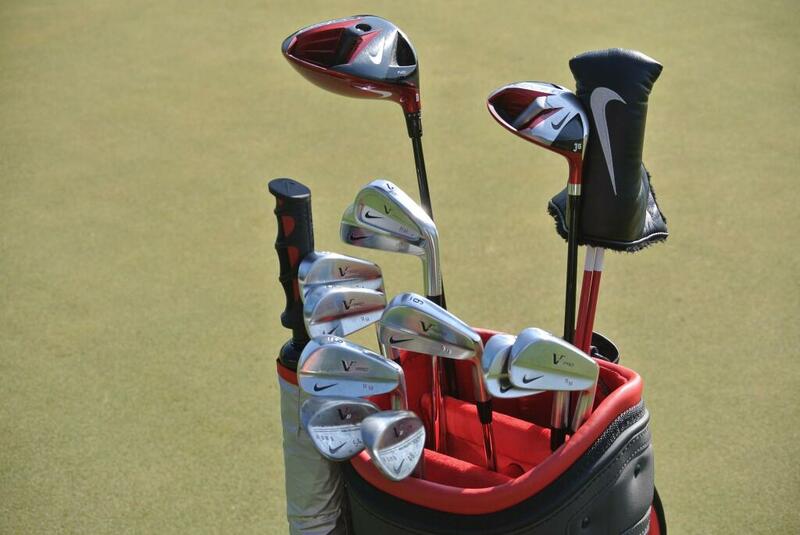 This is where I think most Tour players are becoming smarter and are gaining more distance in their tee shots. You can see that because in the past 7 years the amount of player with a clubhead speed over 110 have not changes (139 players), but the number of players averaging over 300 yards have increased from 18 to 26. If you take a look at the following chart and understand that these numbers are all assuming a straight club path, a square clubface at impact, and center high face contact we can see how two of the four major impact factors can improve your distance. If you were to take a look at your current clubhead speed on the chart you will see your maximum potential, typical men’s clubhead speed is 90 to 95 miles per hour. 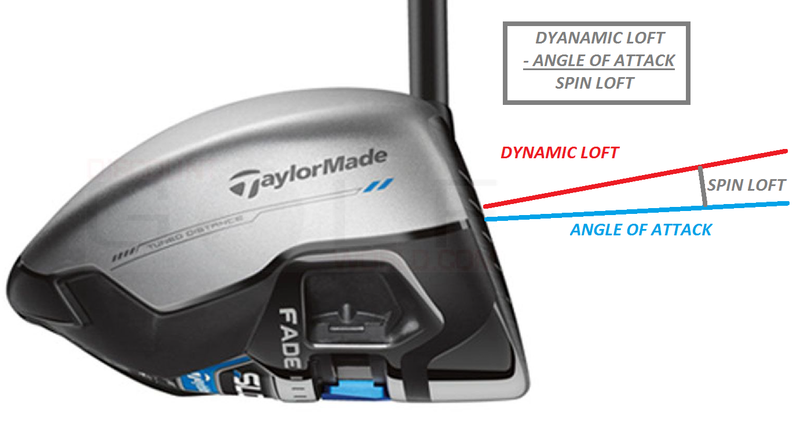 Take a close look at two factors Angle of Attack and Dynamic Loft and I want you to see that players in your clubhead speed zone have different angle of attacks and dynamic lofts how that will effect the potential distance. At the 90 mph zone a player that goes from hitting down on the ball 5 degrees and a dynamic loft of 11 to a angle of attack of up 5 and a dynamic loft of 15.3 there is a potential gain of 28 total yards. The average male player averages between 90 and 95 mph with their driver. Some of you reading might not have heard of a newer term called “Spin Loft” this is simply the difference between the dynamic loft (loft of the club at impact) and the angle of attack (momentum of the center of gravity of the club during impact). 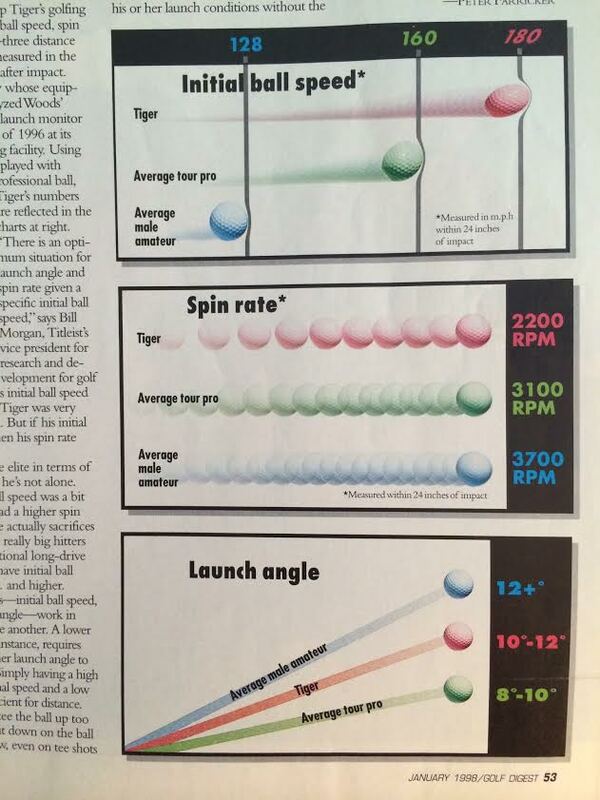 Typically is a differential Spin Loft between 11 and 14 most players would benefit from a better ball flight. Determining if your dynamic loft or angle of attack needs improvement is an easy thing to do by hitting a few shots on FlightScope or Trackman, contact me to take a look at your spin loft. Spin Loft is a great parameter to determiner in you have maximized your clubhead speed on your driver. Don’t jump out of you seat just yet, but I have seen players gain as much as 25 yards to their drives if the factor spin loft is maximized, but one factor that effect spin loft and distance is the face to path relationship. The face to path relationship, in my opinion is one of the largest relationships in the game and is where great players control the consistency of their ball curvature. Take a look at the following charts and notice the 3 ball flights and three different face to path relationships. These are all assuming center, high face impact positions, but as illustrated in the far right image when the face alignment is right of the path direction at impact it is typically due to an improper downswing sequence and there is a lose of clubhead speed in your kinematic sequence. This can possibly increase your dynamic loft and decrease your angle of attack and will elevate your spin loft higher, thus creating higher spin rates and shorter shots. The far left image is really almost impossible to create on any consistent basis and I encourage players that are looking for more distance to move more towards the draw shot. When you shift the direction of the swing to the right players typically start to hit up on the ball better and if the face is slightly pointing left of the path then you will be hitting a shot that turns slightly to the left. More importantly for our distance conversation when your angle of attack goes up and your dynamic loft goes lower, which would happen here, you will lower your spin loft and maximize your clubhead speed and your distance. After you have maximized your current spin loft at your current clubhead speed you are as far as you can go without increasing how fast the driver is hitting the ball. When I look at a players’ fitness levels, I typically want to know how much range of motion a player has while in the transformational zones of the golf swing. There are three transformational zones, backswing, follow through, and full follow through. 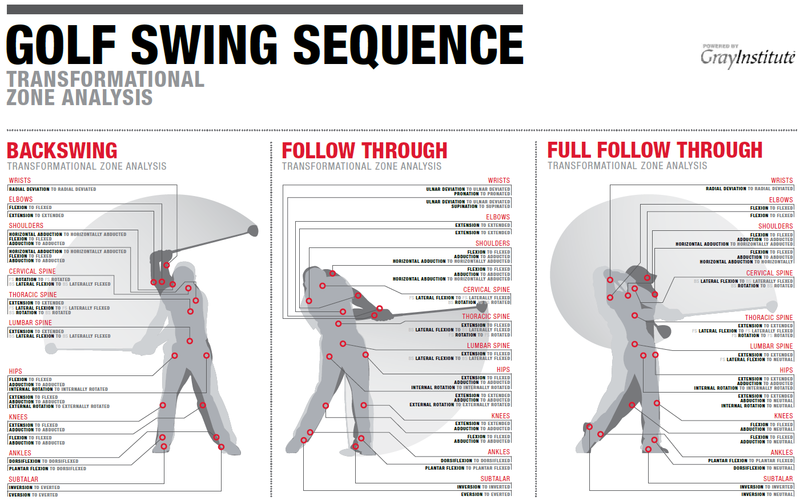 Players can all free up clubhead speed sometime by increasing range of motion in one of these transformational zones. Being that I am a Gray Institute Preformation Specialist, not my process but Gary Gray of the Gray Institute in Adrian, Michigan, I am always evaluating a player and their ability to make certain movements in the golf swing. There are $40,000 machines with sensors that will tell you that your sequence is off, but will not tell you where the limitation is in the persons body or how to eliminate it, this is where I can help players improve movement and gain clubhead speed. These machines are measuring a players kinematic sequence, which measuring the efficiency and order your body coils and uncoils during the golf swing to help maximize club head swing and path. This is what I am thinking about when I see someone hit a golf ball and that is my machine, I am trying to understand why and what part of their kinematic sequence is off and what can we do to improve the Chain Reaction, Gray Institute Trademark. Equipment is the first thing every player goes for and I understand there is a large marketing push with the companies to build their brand and I am completely with them on new technology will improve your game, but there has some considerations to understanding the impact physics and or your fitness level. If there is no consideration of these two areas then your gain in yardage will be minimal. Now with that said, I am TaylorMade staff professional and I think this company currently has the best approach to the market and is willing to push the limits on technology to help players improve their games. The new SLDR was a great improvement and the new SLDR S is even better. The center of gravity is a ever changing discussion in the advancement of driver technology and currently the lower and more forward the manufactures can move it, the higher you can launch the ball and the lower the ball will spin. 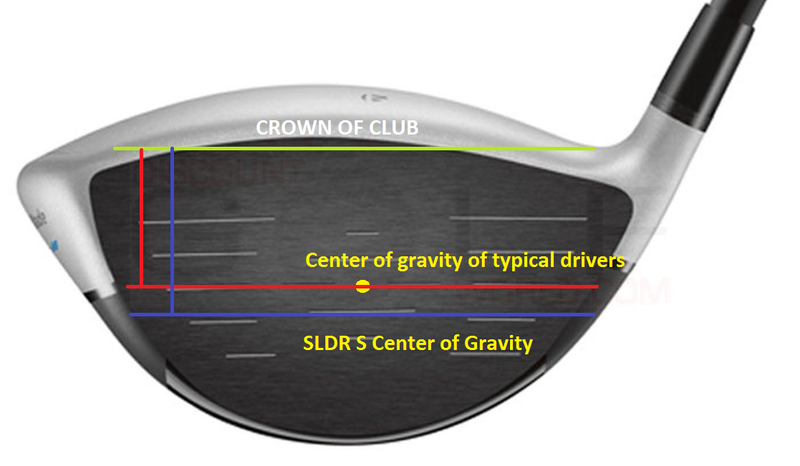 The SLDR S is a probably going to be replaced almost as fast as I can write this article, but the concept will be around for a while, so take a look at the following image to see the gain in impact area with the SLDR S. The goal is to make contact above the center of gravity and since they have moved the center of gravity lower this allows you to hit the center of the face (yellow dot) and not have to hit so high on the clubface to reduce the spin rate. When you hit the ball below the center of gravity the spin rate goes up anywhere between 200 to 500 rpms and when you hit above the center of gravity the spin rate can be reduced and help a player carry the ball further by dialing in their spin rate. 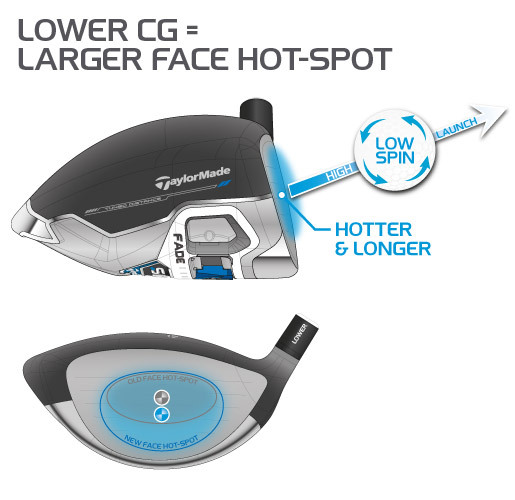 When you hit above the center of gravity and above the center of the middle point the driver has more loft due to the face rolling, so there is more loft on the upper part of the face and lower loft on the bottom of the face. This is why when you hit below the center of gravity it launches lower and spins more. There is also a phenomenon call vertical gear effect that is when the ball is hit below the center of gravity the face tilts forward on point of contact and that also reduced launch angle and creates more spin on the ball. As you can see there are three major areas that you could look at improving your distance and your score. Now you can see what is sort of going through my mind as I am trying to help a player hit it further and gain distance in their tee shots.